The Comet goldfish is one of the easiest goldfish to raise. Diet Type: Omnivore. The minimum Tank Size should be at least: 20 gallons. Temperature: 65.0 to 72.0 F (18.3 to 22.2 C) but also does well in cooler water in fish tanks and ponds. In the 1980s Hugo Mulertt was a Government worker in in the United States, who breed the comet-tailed goldfish from the common goldfish. The comet or comet-tailed goldfish is one of the most common variety of fancy goldfish in the United States. The comet is similar to the common goldfish, except is usually smaller and slimmer, and is noticed mostly by its long beautiful forked tail. The Comets temperament is Peaceful, calm, pleasant, but can live in cooler temperatures . Range ph: 6.0-8.0. Hardness Range: 5 - 19 DGH. The comets are often sold as feeder fish at pet stores. The comet goldfish with the most color, these comet goldfish come in yellow and silver and also come in a combination of other metallic colors. Healthy looking ones will most likely be sold as pets and at a higher price then feeders. Comets can breed with some other types of goldfish like the common goldfish. However, most comets only grow three to four inch in length, and usually become larger if placed in a pond or a large fish tank. There is a few types of Comets goldfish with different personalities and colors, such as the Sarasa comets goldfish. Sarasa goldfish are very beautiful fish. They have some colors on their bodies that reminds you of the Koi carp fish. Comet do well in cold water aquariums at room temperature. Breeding, Keep them well feed and lower the temperature of the water for a period of no less then a month and then slowly raising the temperature again to stimulate spawning for your comet goldfish. They will spread their eggs freely in the water. The egg and fry will be eaten by the parents unless protective measures are taken. The best method usually is to remove the parents from the breeding aquarium once the spawning is completed. There is a small possibility that a few fry might survive to adult in a well planted aquarium or pond. The odds for this is however relatively low. You should at least provide a 20 gallon fish tank, minimum for your Comet goldfish and as the goldfish grows increase the tank size of your tank. Your tank should be larger if you want to have more than one fish. The Comet can reach 10 to 12 inches (20 to 31 centimeters) long, they get the biggest in outside ponds. Get coffee bean sized gravel for the bottom of the Comet goldfish tank (if it is any smaller, the goldfish could accidentally swallow some while feeding). Make sure any rocks or gravel are metal-free, since rocks with metals can harm fish by becoming toxic residues into the surrounding water. To decorate your tank, Buy some ornaments and decorations and fake plants. Do not buy ornaments with openings small enough that the Comet fish can get stuck into. Remember to consider how large your goldfish can get. If you see your fish tends to hang around at the top of the water this could be a sign of oxygen deprivation. Important part of goldfish care is water aeration. Goldfish in general, tend to be oxygen pigs. To keep your goldfish healthy you need to have a fish tank with good surface area exposed to air (top of tank) you can also add an air pump that can use bubbles to increase oxygen content in the water. Cycling your tank is important, Follow the steps to cycle your tank. This establishes healthy bacterial and chemical levels. Adding the Comet goldfish to your tank: It is important to introduce the fish to the tank environment slowly. As soon as you get home from the pet store, float the entire closed pet store plastic bag with fish on the top of your fish tank (with the Comet goldfish inside) for about a 20 minutes. This will allow the water in the plastic bag and the fish tank water to equal out, and the bag to become the same temperature as your fish tank water. Next thing to do is, add a small amount of water from your fish tank to the bag to introduce the new water, and wait about 20 minutes. Do this at least one more time. Dispose of the water down the toilet from the plastic bag. Then, use a net to transfer the Comet goldfish fish carefully into the your fish tank. Dispose of all of the water in the plastic bag. This process not only reduces stress for you fish, it also prevents the dirty pet store water from contaminating your fish tank. Goldfish Diet: Omnivore. Feed the Comet goldfish three times a day in small portions, gold fish do not have stomachs, that&apos;s why small portions more times a day will prevent wasted food. 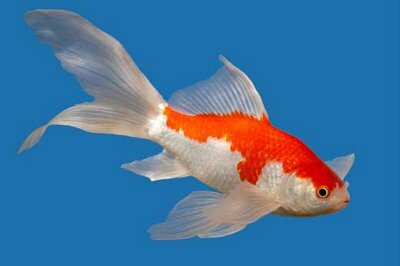 Feed a good quality goldfish food, pellets or flakes. Comet goldfish may also eat frozen foods such as brine shrimp, bloodworms, and krill. Test the water, preparing your tank, Read up on the nitrogen cycle in aquariums for goldfish. You will need to purchase a liquid test so that you can test for Nitrates and Ammonia. The strip-style test kits are unreliable do not really work well and a waste of money. You should use a dechlorinating product to remove the harmful chlorine from the water from tap water. Test for nitrite, ammonia, and proper PH. The ammonia should always be 0, the nitrite should be 0, and the nitrate should be below 20. If it&apos;s at or above 40, you have too many fish or are not changing the water often enough. Doing weekly water changes, once a week, remove and replace 30%-50% of the water in Comet goldfish tank. Removing all the water from the tank will damage the bacteria that has grown that helps decompose the fish waste.